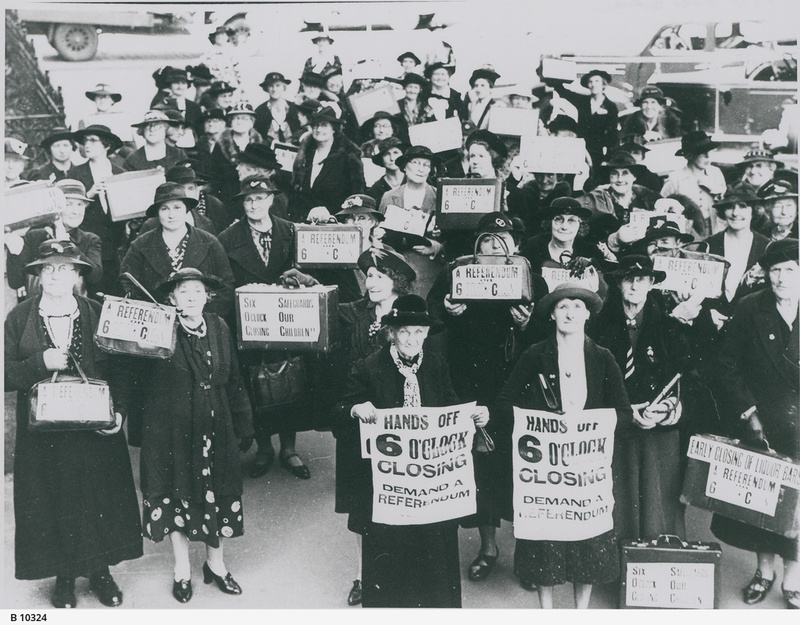 Group of women protest for a referendum prior to changes to hotel hours, assembled outside Parliament House, 21 September 1938. In September 1938 a Bill was before the South Australian Parliament to end the six o'clock closing of hotels imposed during the First World War. On 20 September a group of women representing organisations such as the Woman's Christian Temperance Union, the Housewife's Association and the Womens' Non-party Association met with parliamentarians to discuss their opposition to the Bill. The following day a protest of about 200 women filled the steps at the front of Parliament House carrying bags and suitcases on which were attached placards with slogans against the extension of opening hours. When the women entered Parliament to view the debate from the Strangers' Gallery they were required to surrender their cases at the entrance. Labour M.P. for Hindmarsh, John McInnes, referring to the number of women in the Strangers' Gallery commented "What is the object of the visit paid by this suitcase brigade?" Hours of trading for hotels in South Australia were not extended until 1967.